Buckeye has increased their " in-stock" offerings to include headed concrete anchors and shear connectors We have also added an extensive line of Arc and CD stud welding equipment and accessories - available upon request. Buckeye Fasteners Company, a 100% employee owned company, is a leading manufacturer and supplier of high quality weld fasteners. Buckeye Fasteners products have been a pillar in the automotive industry since the 1920's. During this time, Buckeye (then known as "Ohio Nut & Bolt") began to produce square nuts, machine screws and weld fasteners. In 1928, Ohio's first large, commercial use of weld screws, were on the Model A Ford. 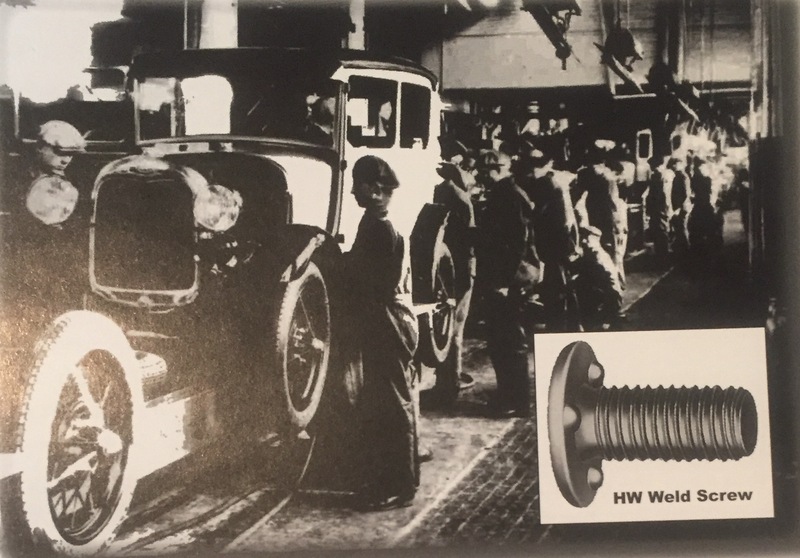 The first HW weld screw was used on the frame of the Model A to allow one handed assembly of fenders. This photo appeared in the newsletter that Ohio Nut & Bolt produced and sent to their customers. Since 1905, Buckeye Fasteners, the sole factory direct source of The Ohio Nut and Bolt Company, has developed, manufactured, and distributed high quality weld fasteners worldwide. Click on the video below to learn more about our history. Buckeye Fasteners will be closed on Friday April 19th.